It should have been a wonderful evening. Stephan and Elisabeth have invited family and friends for dinner, but as soon as Thomas announces that he and his pregnant girlfriend Anna are planning to name their unborn son Adolf, things get out of hand. Even family friend René is drawn into the fight, as secrets are revealed and truths are dragged to light, kicking and screaming. It’s a clash of egos, of wounded prides, and as the evening escalates and unforgiveable things are said on all sides, the argument about baby names turns into a feast of childhood transgressions and hidden passions, served up for all to enjoy. 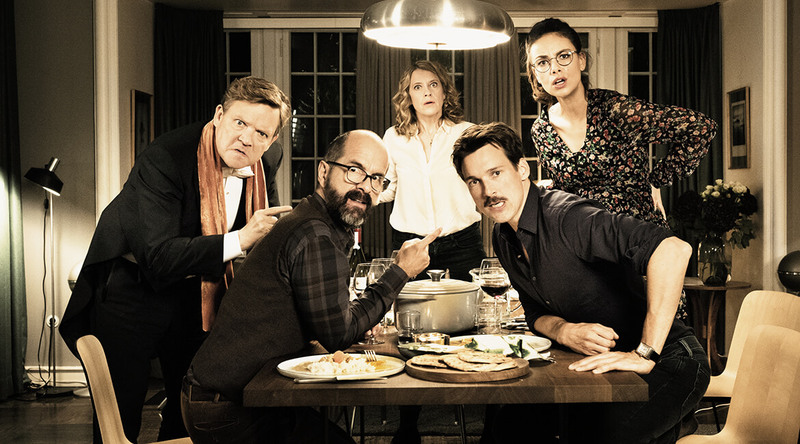 Director Sönke Wortmann deftly helms this incredible, did-he-just-say-that story of a family dinner gone awry, in which German guilt and angst over the Nazi past burst out into the open willy-nilly. HOW ABOUT ADOLF? is an outstanding social satire in which witty dialogue and perfect timing keep the audience on the edge of their seats. A breakout hit at the German box office. SÖNKE WORTMANN ranks among the most respected and most successful directors in Germany. After his graduation movie DREI D (1988) was nominated for a Student Oscar®, his debut feature film MAYBE… MAYBE NOT/THE TURBULENT MAN (1994) became one of the most successful German films in the 1990s. The touching post-war drama THE MIRACLE OF BERN (2003) took Audience Awards in Locarno, San Francisco and Ashland and was released in cinemas around the world. The documentary DEUTSCHLAND. EIN SOMMERMÄRCHEN on the Soccer World Cup 2006 is the most successful documentary in German cinemas to date. His other highly-acclaimed films include ALONE AMONG WOMEN (1991), LITTLE SHARKS (1992), MR. BLUESMAN (1993), THE SUPERWIFE (1996), CAMPUS (1998), ST. PAULI NIGHT (1999), THE HOLLYWOOD SIGN (2000), POPE JOAN (2009), THE WEDDING TAPE (2012), WRECKED (2014), MS. MUELLER MUST GO (2014), and HOW ABOUT ADOLF? (2018).